Chewing Nuts - chewy toffee centre to make your jaw work. Please note: the covering is actually chocolate flavour - though bet you can`t tell from the taste! - Qty In Order: a quarter of a kilogram - just over 8.8 ounces... More..
Treacle Toffee - big chewy chunks of smooth, chewy toffee with the delicious flavour of black treacle. - Qty In Order: a quarter of a kilogram - just over 8.8 ounces... More..
Cinder Toffee - light, crisp, bubbly, sugary traditional sweet - delicious! You may also know it as puff candy or honeycomb! - Qty In Order: 150 grammes... More..
Treacle Toffee Slabs - rich chewy toffee in pocket size break-up slabs - just taste the black treacle and molasses - mouth watering! - Qty In Order: 3 slabs... More..
Creamy Toffee Slabs - We think this is exactly how toffee should come. . . in thick meaty slabs! Toffee just wasn`t meant to be dainty and delicate. . .. the chunkier the better as far as we`re concerned! 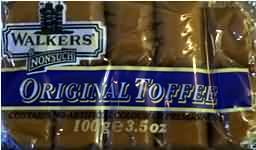 - Qty In Order: 3 slabs... More..
Toffee Whirls - Deliciously creamy, and very nostalgic toffee sweets. If toffee is your thing, and you have a sweet-tooth, these will most certainly hit the spot. Lovely and traditional and very very tasty! - Qty In Order: a quarter of a kilogram ... More..
Fruit and Nut Toffee - smooth creamy toffee crammed with brazil nuts, sultanas and raisins - in slabs like it should be. - Qty In Order: 3 slabs... More..
Walkers Banana Split Eclair Toffee - we know a bloke called Dave - he`s a complete sweets guru having been in the industry for loads of years. He knows about pretty well every sweet you can think of... or that you can remember. And he knows how to ... More..
Grays Tea Cakes - real old fashioned sweet toffee almondy discs - made by Grays of Dudley. - Qty In Order: a quarter of a kilogram - just over 8.8 ounces... More..
Walkers Chocolate Toffees - Smooth creamy toffee from our pals at Walkers (where they make utterly scrumptious toffee). The balance between the rich toffee flavour and the smooth chocolate flavour is spot on! (I often munch on one of these when I ca... More..